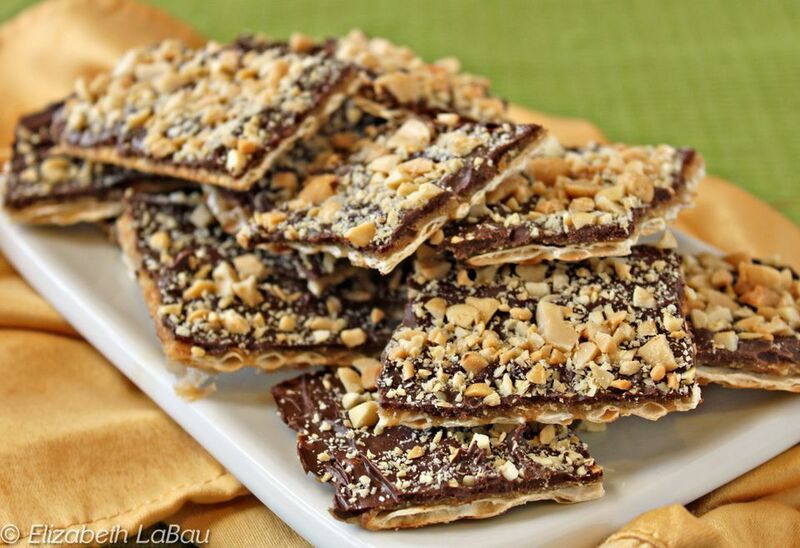 We call this "Magical" matzoh buttercrunch toffee because the taste is out of this world! It's amazing that matzoh sheets, butter, and brown sugar can combine to form a candy that tastes just like toffee. Add some chocolate and almonds, and you have a seriously addicting Passover treat! Cover a baking sheet with aluminum foil, and spray the foil with nonstick cooking spray. Preheat your oven to 350 F.
Cover the baking sheet with a layer of matzoh sheets, breaking them up to fill in gaps if necessary. Combine the butter and brown sugar in a small saucepan over medium heat. Stir constantly until the sugar dissolves. Allow the mixture to come to a boil. Once it boils, keep it boiling for 3 more minutes. Remove the mixture from the heat, and pour carefully over the matzoh. Use an offset spatula or a knife to smooth the top and ensure the sugar evenly covers the entire area. It's okay if there are a few bare spots, it will spread as it bakes. Bake for 10 to 12 minutes, flipping halfway through and checking occasionally to make sure it doesn't burn. If it seems to be getting too dark around the edges, remove it. Once out of the oven, sprinkle the chocolate chips over the top of the toffee layer and let it stand for 1 to 2 minutes until the chocolate chips start melting. Use a spatula to spread the chocolate evenly over the surface. If desired, sprinkle the nuts over the top and press gently to adhere while the chocolate is still wet. Place in the refrigerator to cool. Break into pieces by hand once set.